How many people are familiar with the story of Japan Airlines Flight 123? Not many. Yet, the August 12, 1985 accident remains the worst single-aircraft disaster in history, and the second-worst aviation accident of all time, second only to the Tenerife disaster. All 15 crew members and 505 out of 509 passengers died, resulting in a total of 520 deaths. The Boeing 747-SR46 took off from Tokyo International Airport in Ōta, Tokyo, Japan at 6:12 p.m. About 12 minutes after takeoff, as the aircraft reached cruising altitude over Sagami Bay, the rear pressure bulkhead failed, causing an explosive decompression at the rear of the fuselage which tore the vertical stabilizer from the aircraft and severed the lines of all four of the aircraft’s hydraulic systems. The pilots, including Captain Masami Takahama, set their transponder to broadcast a distress signal to air traffic control in Tokyo, who directed the aircraft to descend and gave it heading vectors for an emergency landing. Continued control problems required them to first request vectors back to Haneda, then to Yokota (a U.S. military air base), then back to Haneda again as the aircraft wandered uncontrollably. With the loss of all control surfaces, the aircraft began to oscillate up and down in what is known as a phugoid cycle, a flight mode typical of accidents that disable an aircraft’s controls. After descending to 13,500 feet, the pilots reported that the aircraft was uncontrollable. It flew over the Izu Peninsula, headed for the Pacific Ocean, then turned back toward the shore and descended to below 7,000 feet before the pilots managed to return to a climb. The aircraft reached an altitude of 13,000 feet before entering a wild descent into the mountains and disappearing from radar at 6:56 p.m. and 6,800 feet. During the oscillations that preceded the crash, the pilots managed a small measure of control by using engine thrust. 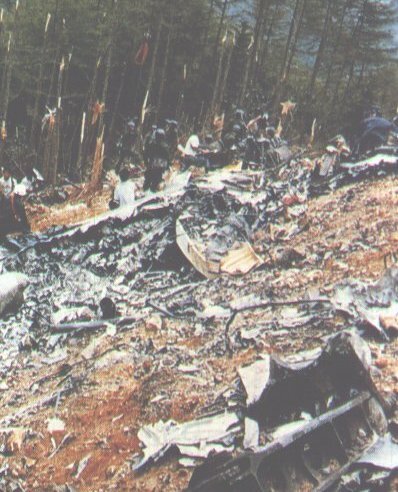 The final moments of the plane occurred when it hit a mountain as a result of this loss of control, flipped, and landed on its back. Thirty-two minutes elapsed from the time of the first problems to the time of the crash, long enough for some passengers to write farewells to their families. There was some confusion about who would handle the rescue in the immediate aftermath of the crash. A U.S. Air Force helicopter was the first to the crash site, some 20 minutes after impact. The crew radioed Yokota Air Base to assemble rescue teams and offered to help guide Japanese forces to the site immediately. Japanese government representatives ordered the U.S. crew to return to Yokota Air Base because the Japan Self-Defense Forces (JSDF) were going to handle the rescue. 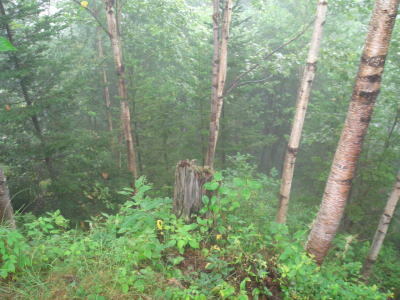 Although a JSDF helicopter spotted the wreck during the night, poor visibility and difficult terrain prevented it from landing at the site. The helicopter pilot reported no signs of survivors. As a result, JSDF personnel did not get to the site as quickly as they might have, spending the night in a village 63 kilometers from the wreck, and not arriving until the following morning. Medical staff found a number of bodies whose injuries indicated that they had survived the crash but died from shock or exposure while awaiting rescue. The four female survivors were seated towards the rear of the plane: Yumi Ochiai, an off-duty JAL flight attendant, age 25, who was jammed between a number of seats; Hiroko Yoshizaki, a 34-year-old woman and her 8-year-old daughter Mikiko Yoshizaki, who were trapped in an intact section of the fuselage; and a 12-year-old girl, Keiko Kawakami, who was found wedged between branches in a tree. Among the dead was the famous singer Kyu Sakamoto. Ochiai recounted from her hospital bed that she recalled bright lights and the sound of helicopter rotors shortly after she awoke amid the wreckage, and while she could hear screaming and moaning from other survivors, this gradually died down during the night. A more gruesome series of images from the crash site can be found here. 1. The aircraft was involved in a tailstrike incident at Osaka International Airport on June 2, 1978, which damaged the aircraft’s rear pressure bulkhead. 2. The subsequent repair performed by Boeing was flawed in order “to make it fit”, reducing the part’s resistance to metal fatigue by 70%. During the investigation Boeing calculated that this incorrect installation would fail after approximately 10,000 pressurizations; the aircraft accomplished 12,319 take-offs between the “repair” and the final accident. 3. When the bulkhead gave way, it ruptured the lines of all four hydraulic systems. With the aircraft’s control surfaces disabled, the aircraft was uncontrollable. Rumors persisted that Boeing had admitted fault to cover up shortcomings in the airline’s inspection procedures and thus protect the reputation of a major customer. Without admitting liability, JAL paid 780 million yen to the victims’ relatives in the form of “condolence money”. Its president, Yasumoto Takagi, resigned and a number of JAL employees and one Boeing employee committed suicide to “apologize” for the accident. The video clip below (which I recommend viewing) contains more details and uses a flight simulator to recreate portions of the last flight. The clip concludes with the cockpit audio from the final 40 seconds of the flight. As an interesting “oh by the way”, the last 38 seconds of the cockpit voice recording appear on certain pressings of the album Reise, Reise by Rammstein. Tags: JAL 123, Japan Airlines, Japan Airlines Flight 123, Japan Airlines Flight 123 Crash. Bookmark the permalink. Previous post ← Been A Doorman Lately? Much of your text seems taken word-for-word from Wikipedia. Nothing wrong with that, but might be nice to credit them. I was a teenager living at Yokota the summer this happened and remember this crash distinctly. I was at a girlfriend’s house — her dad was a commander of one of the units at Yokota Air Base. He got a phone call shortly after dinner about the plane crash not far from Yokota and he was out of the house. U.S. Marine and Air Force rescue teams were on the scene within a half hour, and there was a lot of anger among the local military commanders about the Government of Japan refusal to accept American assistance. my father died in that planecrash. Even though its been over 20 years since the accident, the pain of loosing him in such a horrific way never goes away. We were one of the 54 families that sued Boeing for loss of income since my dad was only 54 at the time of the accident. What many people don’t know, the accountability of the accident was split 60 40 between Boeing and JAL, even though Boeing did the repairs, JAL was held responsible for not making sure that they were done right. My father’s body was among the first to be found, but many relatives of the other dead never were so lucky. Only the passengers that were seated in the last 3rd of the plane were actually identified, the others were burnt beyond recognition and the cockpit and pilots were never found. 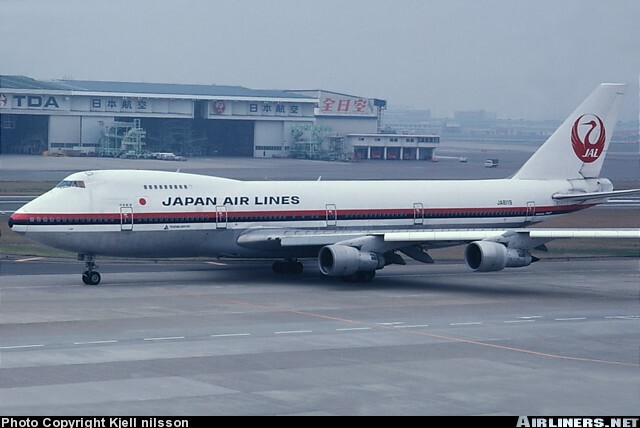 The reason so many died in this single aircrash is that JAL modified the 747, i.e. putting seats closer together to fit more peeps on the plane, to maximize potential passenger load and I guess profit. Even though we received a settlement from Boeing and JAL, it didn’t justify the means – 520 people died because the decision was made to make the repair to JAL123 as cost efficient as possible, i.e one row of rivets instead of two. I hope that 520 people didnt die in vain , let us never forget. Haven’t ever forgotten about this flight, I had a dream about the accident prior to it happening. Knew it was going to hit the mountain. That the people knew they were going to die and were writing letters and reading the bible. I saw the mother and daughter the young girl and the stewardess at the back of the plane. I saw the back door open. I had prayed for them to live. But I didn’t know until the tenth anniversary that they had survived. This was something that I will never forget. It was so real at the time. My dream was seven days before this had happened. I wanted to tell someone but who would believe it. What flight was it. What day. I couldn’t tell them that. Only that it was in Japan and it was going to hit Mount Fuji. And that it was a huge airplane with hundreds on Japanese on board. I have the newspaper article from the tenth anniversary. And I wanted to die. And if I didn’t get my answer then I’m out. Which means to “except with in”. In Spanish. So I stayed with my life and ended with seventeen miscarriages. In 1990 I had another dream that I was going to have a baby girl. I ended up adopting a baby girl. Now she’s 25 yrs old. So if I didn’t have the dream I wouldn’t have live long enough. To see my baby girl. God saved me that night. There was more into the dream but I gave you most of it. Does it prevent you from flying? Someone plz tell me the name of the engineer of JAL 123 who was partly or fully resposible for the Crash. Im doin a small report project about this crash as a student in sri lanka, and in looking for as much as info i could colect. I do not recall his name but he committed suicide. It makes me sick to know that the Japanese Goverment did not let the U.S helicopter help those poor people just lying on the ground. When perhaps a few could have been saved. It was politics, not racism. According to conspiracy theorist Benjamin Fulford, who lives in Japan and is a regular guest on the Jeff Rense Show, Bush, Sr. gets the blame for this crash. I wondered if Fulford was confusing 2 different crashes? He claims Bush was trying to crash the Japanese economy and had this jet shot down, then had our military helicopter deny Japanese rescuers access for the critical first 24 hours. Bush is quite a murderous thug, but this claim doesn’t make sense. Your link to “A more gruesome series of images from the crash site can be found here.” does not work. Can you post the correct link, if it is still available? Thanks! Thanks for bringing that to my attention, Todd. I’m afraid the site I originally linked to seems to have been taken down. However, I found another site that works and have updated accordingly. It’s a bit slow to load, but it works. As an attorney, I wonder why the Japanese government backed away from going after Boeing when the facts seem to clearly demonstrate liability. As a political “junkie”, I wonder about the degree the Japanese government, and JAL, were “leaned on” [as Musharraf was in Pakistan when America wanted access to Pakistani airfields and assets]. I suspect the answers are as obvious as the questions, but so much in the political arena gets buried in the name of “national security”. So much tragedy and so little accountability . . . the story of politics everywhere. It appears more likely that they would have been afraid of more “bad publicity” due to the fact of their refusal to allow the first-on-scene responders to aid the crash victims. And frankly, whatever person/section of the Japanese government was responsible for calling off the marines is guilty of first degree murder in my opinion. I am not a lawyer, but they had to assume there were survivors until proven wrong, and therefore ANY limiting of initial aid response was tantamount to knowing, premeditated, murder. They are as responsible for many of the deaths as anyone else involved. You do realize that the service was done by Japanese maintenance employees right? That they are hired and paid by JAL, they failed to fallow proper Boeing procedure. Boeing has nothing to do with fault. How are you an attorney? Yes, that is the case as established on the TV show Air Crash Investigations or Air Emergency/Air Disasters (depending on the country you live in). Al Breeck mentions it in his post below “the bulkhead was repaired improperly, using one row of rivets instead of two.”. That is exactly what was determined on the documentary. If you want to see the full episode, there is a link at the bottom of the comments page to the youtube video. Due to the non-Japanese passengers onboard, the U.S. military could have told Japan’s government to shove it until absolutely certain not a single American citizen didn’t need immediate assistance. Once a single survivor was shown on camera, Japan would’ve instantly backed down from the turf war. Although if the U.S. government was involved in a similar disaster, say 16 years later, the result would have been – Congressional investigation, no one fired or even demoted, and a fawning media never questioning their staggering incompetence. This horror is on the TV series. This is the one in which the bulkhead was repaired improperly, using one row of rivets instead of two. Oddly the show glossed over who made the repairs exactly and as usual doesn’t even mention liability. Another episode with a horrifying result depicted a maintenance supervisor skipping steps as a trainee doomed a plane with incorrect adjustments. The explosive failure ripped away half of the tail & rudder so even with hydraulics, no way to steer using the tail. It’s likely that the reason Air Crash Investigations do not go into liability is that the program is focused on finding the reasons behind the crashes rather than assigning legal blame, and that no air crash is EVER the result of one single cause. We speak of breaking the chain that leads to the accident deliberately — breaking any one link in the causal chain will usually abort the accident. And that’s what it is all about. I’m a Japanese, male, age 45 more. I’ve kept researching on the crash personally for these years. In conclusion, the story behind the crash is not what you’ve ever been informed. It’s not an accident but a kind of military conflict. I hope my website could help you understand what really happened in JAL123 crash case. Do some research if you got time, about the relationship with the plane crash, and the coming of Microsoft. I read sometime ago that the Japanese government was about to promote an Operating System which would make Microsoft Windows obsolete. After tremendous unsuccessful pressures, the US decided to do this. Almost all the engineers working with the Japanese OS were in that plane. After they died in that planes crash, Microsoft came out to dominate the market. The truth is that a Marine helicopter was over the crash site and ready to send a Navy Corpsman and Marine Rescue Aircrewman down to look for survivors within 1 1/2 hours after the crash after being directed by an overhead Air Force C-130 which had found the crash within 20 minutes. However, they were called off on orders from the Japanese government via the Duty Officer at Yakota Air Base. I know, because I was the Marine Rescue Aircrewman. Thank you for sharing that, Bruce. I am an avid watcher of a show called “Air Crash Investigations” (I think it’s called “Air Emergency and Air Disasters” in the USA). Anyway, this is a very reputable show that features in depth analysis of the facts by professionals from the American NTSB and their equivalents in other countries along with metallurgists and other specialists in the field. If you want to see the full episode it is on youtube..
…according to the show, there was no conspiracy, it was stress fractures on the rear bulkhead which caused it to fail, I won’t give away the other details so as not to spoil it for any readers who want to watch that episode. I still think that the US. Commander could / should’ve just ignored the Japanese with some kind of excuse .. like they were already on the ground and we couldn’t retrieve them or something… while the fault clearly lies by the Japanese responsible for calling them off. Pride can become quite troublesome if one can’t get over it, and to know when one should ask for help or let someone help of their own accord is a crucial element of how society should work for making life better for everybody. Maybe i am interpreting to much into the Japanese people when i only know a few of them personally and never have been to Japan.